Never let it be said that the Publicity Queen team miss an opportunity to learn about the world of PR. This week my very own Royal Advisor, Libby Collett, winged her way down to Sydney to the Ultimo studios of the ABC for the taping of Gruen Planet. Libby tells me there was a great deal of comedic gold that didn’t make it into the ‘can’ on the night, with several hours of filming finally condensed into a half-hour episode that went to air on Wednesday night. Among the evening’s highlights were the hilarious comparisons between first-timer on the panel, Stuart Gregor of Liquid Ideas and mainstay Russel Howcroft of George Patterson Y&R, who looked disturbingly alike; and Wil Anderson said he felt very outnumbered by the two baldies on the panel, only to turn around and be faced by the handsome and clean-shaven heads of the two creatives behind The Pitch – Jeff Champtaloup of BrainCELLS in Perth and Guillaume Roux of Sense in Melbourne, who each tried to convince us not to bet on the Melbourne Cup. Watch the various pitches here and decide for yourself. The show provides a tremendous opportunity for PR creatives to share their insight about our industry, how it works and why, and just how much can be invested in the purchase of the most intangible of commodities – influence! Even though I have been working in the field of PR for many years, every so often, I get a reminder about the effectiveness of certain strategies and how just one story appearing in a mainstream newspaper can cause a media sensation. This month, I got a refresher lesson in the power of syndication in major newspapers to give excellent ROI. Earlier this month we were successful in assisting our client, Wesley Weight Management, in profiling one of their many successful clients and her weight loss success. Kim Balke (pictured left) was one of several people featured in a story “My Mid-Life Crisis Was a Blessing“, and appeared in the Body and Soul feature section in the Sunday newspaper feature for no fewer than seven major metro titles. This development was such a pleasing result for our client, and reinforced in my mind the power of newspaper syndication as a tool for spreading a story nationally that began in just one city. Kim’s story appeared in the Daily Telegraph (Sydney); Herald Sun (Melbourne); Sunday Mail (Brisbane); Sunday Territorian (Darwin); and Sunday Mail in both Perth and Adelaide. In addition, it appeared on the News Ltd’s influential website news.com.au as well as other regional websites. These successes do not come easily, and this result was the culmination of much hard work by Publicity Queen in collaboration with Wesley Weight Management, but the result was beyond our expectations. So, what can we learn from this? In newspaper markets like that in Australia, which is highly centralised, and in which syndication and copy sharing are widespread, there is a golden opportunity to give a story a life beyond its initial printing, if you target a media group rather than just one title; such as the News Ltd group, Fairfax, and there are similar amplification (pardon the pun!) effects that can be achieved through having a story picked up by a radio network, or through television. As always, it is the appeal of the story in the first place that will determine its success. Pitching a story the right way is important, but providing content that people actually want to know about, that’s the ticket. Searching out those story ideas should be at top of mind importance for all managers if they want to get their business greater exposure. Media and Marketing Full of Whingers? Evening all! It was reported today that there are certain professions that are full of whingers, and it surprised me to read that two of the professions listed are close to my work in PR, namely in media and marketing. A recent survey has found that moaning co-workers, boredom, lack of training and acknowledgement for good work are among the top grievances cited by unhappy Australians. Working long hours and having too much to do also rated highly among disgruntled staff. The survey, conducted by training organisation Upskilled, revealed those less likely to complain about the workplace worked on a farm on in a legal environment. Among workers’ wish list for a happier career are getting more recognition (30 per cent), being able to work from home (27 per cent) and getting more support from the boss (20 per cent). Surprisingly massages rated more highly than a bar or gym, with one in five workers, or 18 per cent of people quizzed, saying it would help lift morale in the workplace while almost half of all workers wanted to see a reward system introduced into their jobs. Among those surveyed, travel and tourism operators said their biggest gripe was boredom (66 per cent) while architects cited having too much to do (50 per cent). For those in event management having an unsupportive boss was their biggest concern (50 per cent) but for sales staff it was decisions being made behind their back (42 per cent). Director of Upskilled, Mark Sexty said the research showed employers needed to sit up and take notice of issues that made valued members of staff miserable. “Employers may not control every single aspect of the working environment, but they can make sure they are offering adequate training and providing acknowledgement for achievements within the workplace, in order to keep staff happy and motivated,” he said. What do you do to keep your workplace happy? For us, we celebrate our ‘wins’ and our anniversaries, we socialise, share photos and funny stories and pat each other on the back when we have success. And we eat chocolate! Let us know your tips for keeping the whingeing at bay. We came, we saw, we TEDed! 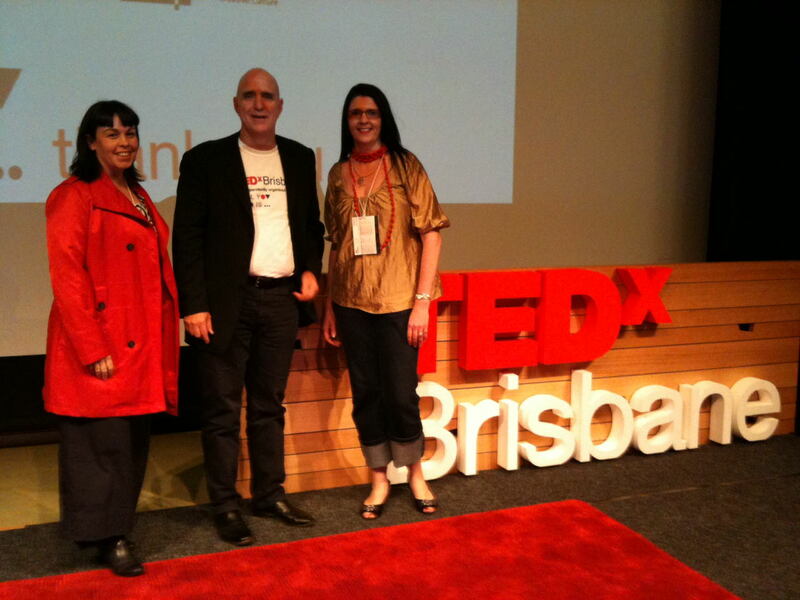 Last Saturday was a very exciting and enjoyable experience for me and for my Royal Advisor as we attended TEDX Brisbane 2011. There we are on the left, pictured with Paul Fairweather, who along with Carl Lindgren did an extraordinary job in pulling together a day of fascinating and inspiring ideas. The theme for the day was “all you need is…” and this answer varied widely from hope to adversity and covered a broad span of concepts. For those of you not familiar with TED, it is an organisation committed to the collection and dissemination of ‘ideas worth spreading.’ These ideas are captured in the form of short webcasts that are freely available on the internet, having been captured at a TED or TEDX (x for extension) event around the world. On the day that TEDX took place in Brisbane, there were 22 other events globally. So firstly, sincere thanks and congratulations go to Carl and Paul for organising the event and attracting such interesting speakers. Secondly, I wanted to share a few little nuggets of wisdom and inspiration that were gleaned on the day. The day began rooted in ancient tribal wisdom, courtesy of the first speaker, Frank Ansell. He had such a calming presence and spoke with great honesty about his homelands in the Eastern Arrernte desert of Central Australia, and invited us all to reconnect with our spirit. He actually hosts retreats to his ‘country’, and the offer is very tempting I must say! Then we had Eddy Harran who introduced me to the concept of K/no(w)mad, which is a play on words of nomad, with an emphasis on knowledge and he shared that there is a growing collective of such folks who through digital technology are connecting around issues and content, sharing ideas and creating collaborative projects around the world. This appeals to me as an idea, and it occurred to me that this is what we are at Publicity Queen, a geographically-dispersed group of thinkers (and doers!) who share ideas and collaborate on projects of mutual interest. We also heard from energising new thoughts from Dr Ross Cunnington about how the brain enables us to mirror each other when we meet and interact, and from Gordon Hamilton who as a composer is deconstructing old forms of musical composition and through an anarchical new method, capturing both words and music direct from social media. There were many speakers whose own decisions and approaches are challenging old ways of thinking, including Paul Osuch of the Anywhere Theatre Festival, who is breaking down the stranglehold of venue owners over theatrical experiences; and by artist Hazel Dooney, who similarly has broken away from the established world of galleries, and art agents and has created a whole new way for artists to interact with audiences and patrons which for her has been very rewarding professionally and personally. There were also many heart-warming stories of people who have taken up the challenge to be the change they wanted to see in the world, including Jeff Waldman who has just returned from hanging swings in Bolivia – changing the world one happy child at a time; and Jean Madden, the compassionate dynamo behind ‘Streetswags’. The stand-out highlight was a Skype call with renowned Australian academic Eva Cox, who spoke simply and eloquently about the need to put people ahead of politics, the focus on the collective good, that society was more important than economy, and that by focussing on the numbers, our politicians had lost sight of what was really important – people and their well-being. As is often the case at TED, it is the people whom you meet on the day that are just as exciting as the speakers that you listen to, and it was a real buzz to be in a room with so many thoughtful, revolutionary people, who gathered to share and impart ideas. Intoxicating! To share your experiences of TEDX Brisbane 2011 use the Twitter hashtag #TEDXBrisbane to continue the conversation. Romeo Montague, the youthful and ill-fated hero of Shakespearean fame once opined: “what’s in a name?”, and for him his name cost him his love and eventually his young life, and while the risks of potential loss in using the wrong name in business are not quite so severe, it is still a matter for serious thought. Many entrepreneurs identify themselves personally with their businesses, and name the business after themselves or their families – such as Linfox (Lindsay Fox) or Harvey Norman (Gerry Harvey) and in these cases, it is the success of their business that has made their names renowned. However, when a business is first starting out, it is much more important that your business name actually reflects what it is that you do, and thus helps you to find customers. In our case, from Publicity Queen, you know that we do publicity and that we have a stylish sense of humour about ourselves. What inkling would you get from Jones Industries? Use your business name to reflect who you are and what you do. There are lots of both examples to admire and cautionary examples all around us. And the interplay between your business name and your internet domain can be enlightening too. For example, the Nepean Institute for Education and Training – this is a great business name, it identifies it with the local area (Nepean, Victoria) and shows exactly what it does. Only trick is, when you write their aconym (www.niet.com.au) part of their web address it spells ‘niet’ which in many cultures means ‘no’. Also, they missed the opportunity to use the suffix of ‘.edu’ which adds credibility as an education provider. My gentle suggestion (if they asked me, and they haven’t) might be www.nepean.edu – it is short, it identifies their location and shows that they are in education. It is also fascinating how people’s names can be an asset or a hindrance. Recently I read about John Winning (yes, that’s his real name!) who is the brains behind AppliancesOnline. John’s parents ran Winning Appliances (love that – great name, personal connection and it’s obvious what they do) and he has branched out, with his new company – AppliancesOnline that leaves you in no doubt about what they are all about. So, the point is to choose business names and domains that assist you, and that inject your own personal style and ethos, but be careful that it doesn’t get in the way of your core purpose. Chosen carefully, it will help you to stand out from your competitors and provide an opportunity for your customers to make a genuine connection with you for the long term. Publicity Queen, as PR Partner for The Growth Faculty, is very proud to announce that Hollywood actor, producer and activist George Clooney has joined the star-studded line-up at the Global Leadership Forum that will take place in Sydney in December. The announcement yesterday sent an excited ripple through the Australian media yesterday, featured on national television, radio and in both major metro and regional newspapers and online. Mr Clooney will join other business rockstars including Martha Stewart, music industry legend Russell Simmons, Nobel laureate and South Asian micro-loans innovator Muhammad Yunus, Monster.com founder Jeff Taylor and internet security guru and founder of Reputation.com – Michael Fertik. This stellar line-up of entrepreneurs and thought leaders will head to Sydney for a one-day event where they will reveal personal insights that will change the way you think about your business. It is fair to say that not all of us could best be described as ‘morning people’ (and anyone who has seen me prior to my morning intake of Dilmah would vouch for this), nevertheless, it seems the content chirruping around the world on Twitter in the morning contains ‘happier’ and more upbeat content in the morning than at any other time of day. Fascinating research commissioned by Scott A. Golder of Cornell University used Twitter and language software to track the moods of 2.4 million people in 84 countries over a period of two years. They found that there are two daily peaks for positive mood – early in the morning, then later around midnight. The down period was the workday, a pattern that remained consistent, although overall the most happy tweets came through on weekends. No big shocker there, although on Saturdays and Sundays the morning happy bubble emerged later than on weekdays. This pattern of happy morning and midnight tweeters was observed across the globe, in various cultures and geography. Even in the United Arab Emirates where the work week shifts slightly from the universal norm of Monday through Friday, to Sunday through Thursday, the same pattern emerged. So, what happens to us? Do we start off happy and then that feeling dissipates through the day? And why does happiness re-emerge in the middle of the night? These are interesting questions. If we are in the business of disseminating information, does it mean that good news is best received in the morning? Speaking of receiving good news in the morning, did you know our e-magazine Queentessentials is sent out in the morning on the first Tuesday each month? If you are not a subscriber yet, click here to do so. October’s edition is themed ‘Going Global’ and is packed with informative content including an interview with Gruen Planet producer Jon Casimir and much more.